LIMITED TIME SALE PRICE! FAST FREE DELIVERY TO YOUR DOOR! GUARANTEED LOWEST PRICE! No Extra Charge for Liftgate Service or Residential Delivery! 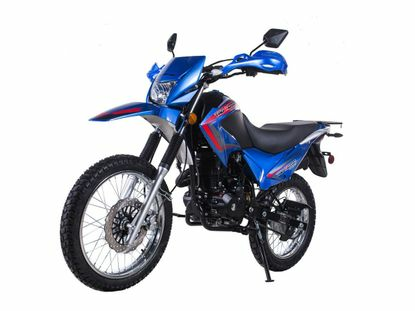 The JetMoto Enduro Street Legal Dirt Bike 5 Speed Manual w/ Electric Start & Kick Start - R7 features a Powerful Air-Cooled, 5 speed manual Transmission Engine. The easy to use Electric Start makes starting simple plus this model offers a Kick Start backup. The 2019 Jet Moto is the affordable motorcycle that can tackle a dirt trail or be a street commuter that gets up to 80-MPG with its reliable 229cc engine complete with push-button electric-starting, telescopic front forks, a large tank, and plenty of torque and power. The R7 is the perfect choice for trail enthusiasts and commuters alike. With sharp, competition-like styling, a choice of blue, green or Special White bodywork with new, distinctive graphics, and a 34 inch seat height, this motorcycle delivers the agile maneuverability and fun that JetMoto is known for. Push-button electric start ﬁres up the bike consistently, powered by a small and reliable battery plus kick-start backup. Your satisfaction is our #1 goal. We strive to provide our customers with the highest level of customer service and support we can. We strongly suggest our customers read the following information thoroughly. If you have any questions about any of our or the manufacturers warranty policies, please feel free to contact us.